According to some experts in the United States, more than 10% of the waste stream in the US are plastics. 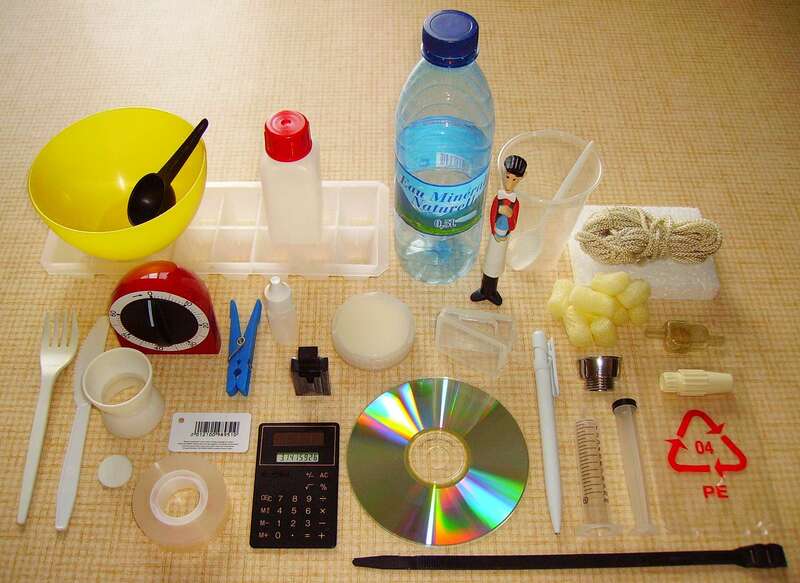 Most plastics are made using natural gas or some other kind of petro-chemical product. The more plastics used – the more petroleum products are needed. When plastics are recycled, they are usually down cycled; that is, they are used to make a lower quality form of plastic. For example, the plastic water bottle cannot be recycled into a plastic bottle again. 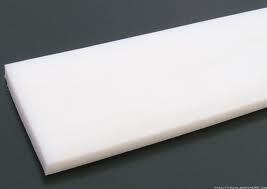 Instead, the resins from plastic bottles are used to make products like insulating fill for winter jackets and so on. Common products that are made from recycled plastics are: toys, auto parts, plastic pipes, cloth fibers, tables, and many other products. Polyethylene terephthalate (PET or PETE) is a thermoplastic polymer resin of the polyester family and is used in synthetic fibers; beverage, food and other liquid containers; thermoforming applications; and engineering resins often in combination with glass fiber. The majority of the world’s PET production is for synthetic fibers (in excess of 60%), with bottle production accounting for around 30% of global demand. In the context of textile applications, PET is referred to by its common name, “polyester,” whereas the acronym “PET” is generally used in relation to packaging. Polyester makes up about 18% of world polymer production and is the third-most-produced polymer; polyethylene (PE) and polypropylene (PP) are first and second, respectively. Biaxially oriented PET film (often known by one of its trade names, “Mylar”) can be aluminized by evaporating a thin film of metal onto it to reduce its permeability, and to make it reflective and opaque (MPET). These properties are useful in many applications, including flexible food packaging and thermal insulation such as “space blankets”. Because of its high mechanical strength, PET film is often used in tape applications, such as the carrier for magnetic tape or backing for pressure-sensitive adhesive tapes. Non-oriented PET sheet can be thermoformed to make packaging trays and blisters. If crystallizable PET is used, the trays can be used for frozen dinners, since they withstand both freezing and oven baking temperatures. As opposed to amorphous PET, which is transparent, crystallizable PET or CPET tends to be black in colour. PET is also used as substrate in thin film and solar cell. These bottles if placed in direct sunlight they can withstand there for a very long time (five years approximately). As the time passes these bottles become opaque. High-density polyethylene (HDPE) or polyethylene high-density (PEHD) is a polyethylene thermoplastic made from petroleum. Known for its large strength to density ratio, HDPE is commonly used in the production of plastic bottles, corrosion-resistant piping, geomembranes, and plastic lumber. 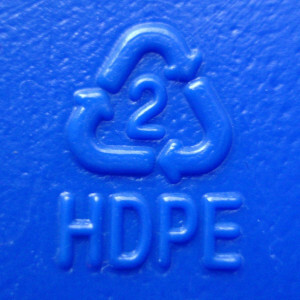 HDPE is commonly recycled, and has the number “2” as its recycling symbol. HDPE is known for its large strength to density ratio. The mass density of high-density polyethylene can range from 0.93 to 0.97 g/cm3. Although the density of HDPE is only marginally higher than that of low-density polyethylene, HDPE has little branching, giving it stronger intermolecular forces and tensile strength than LDPE. The difference in strength exceeds the difference in density, giving HDPE a higher specific strength. It is also harder and more opaque and can withstand somewhat higher temperatures (120 °C/ 248 °F for short periods, 110 °C /230 °F continuously). High-density polyethylene, unlike polypropylene, cannot withstand normally required autoclaving conditions. The lack of branching is ensured by an appropriate choice of catalyst (e.g., Ziegler-Natta catalysts) and reaction conditions. Milk jugs and other hollow goods manufactured through blow molding are the most important application area for HDPE – More than 8 million tons, or nearly one third of worldwide production, was applied here. In addition to being recycled using conventional processes, HDPE can also be processed by recyclebots into filament for 3-D printers via distributed recycling. Above all, China, where beverage bottles made from HDPE were first imported in 2005, is a growing market for rigid HDPE packaging, as a result of its improving standard of living. In India and other highly populated, emerging nations, infrastructure expansion includes the deployment of pipes and cable insulation made from HDPE. The material has benefited from discussions about possible health and environmental problems caused by PVC and Polycarbonate associated Bisphenol A, as well as its advantages over glass, metal and cardboard. LDPE is defined by a density range of 0.910–0.940 g/cm3. It is not reactive at room temperatures, except by strong oxidizing agents, and some solvents cause swelling. It can withstand temperatures of 80 °C continuously and 95 °C for a short time. Made in translucent or opaque variations, it is quite flexible, and tough but breakable. LDPE has more branching (on about 2% of the carbon atoms) than HDPE, so its intermolecular forces (instantaneous-dipole induced-dipole attraction) are weaker, its tensile strength is lower, and its resilience is higher. Also, since its molecules are less tightly packed and less crystalline because of the side branches, its density is lower. 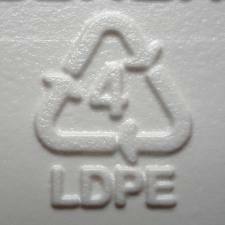 LDPE contains the chemical elements carbon and hydrogen. Juice and milk cartons are made of liquid packaging board, a laminate of paperboard and LDPE (as the water-proof inner and outer layer), and often with of a layer of aluminum foil (thus becoming aseptic packaging).